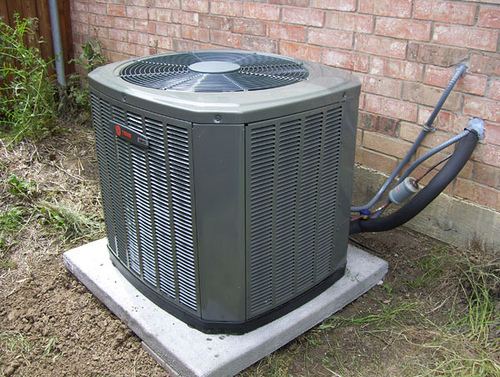 Home Costs > How Much Does a Trane Air Conditioner Cost? How Much Does a Trane Air Conditioner Cost? Trane, known as the world leader in air conditioning systems, is considered to be one of the most complete lines of air conditioning systems on the market. Trane offers over eight models to choose from, ranging from a budget-friendly model to a higher-end model, ranging from 1.5 to five-ton units. How much does a Trane air conditioner unit cost? On average, the least expensive Trane air conditioner can cost at least $2,000, while the most expensive Trane air conditioner prices can reach up to $8,000+. The prices are going to greatly depend on the contractor you choose, the SEER rating, the exact Trane model, compressor and your geographical location. Keep in mind that these are price ranges for a residential setup. If you want to get an exact quote for your home from local HVAC contractors, consider getting multiple quotes for free from licensed contractors at HomeAdvisor.com. XV20i - The most advanced and highest in terms of efficiency. - Equipped with a variable speed motor and multi-stage cooling option. - The Trucomfort feature is able to control the temperature up to 0.5 degrees. XL20i - The most advanced and highest in terms of efficiency. XL18i - A two stage cooling unit, equipped with a 12-year warranty. - Single- and 2-stage ClimaTuff compressor. XB13 - Lower-end units, which come with a 10-year warranty. - Single stage cooling system with a single compressor. Before a contractor is even able to install your new air conditioning unit, he or she will first have to determine where your climate, how much insulation you have, the windows and your home size. With this information, they will be able to determine the correct A/C unit size, which can range from a 1.5 ton to 5-ton unit. Trane offers a unique spine-fine coil system made of pure aluminum, which increases the system’s durability and SEER rating. Extra features, depending on the model, includes programmable thermostats, filter alters, sound dampening features and/or remote access, making it possible to access your A/C settings via a smartphone. The higher-end models do offer a communicating system for an additional monthly fee. This 2-wire control circuit will control the entire system, adjusting the whole system according to the outdoor elements. The installation rates will vary from region to region, and if an air conditioning unit is being installed for the first time, then the ductwork may need to be installed and/or modified, increasing the time the installer needs to spend at your home. The same can be said about older ductwork that may need to be replaced. A good Trane contractor, according to the official company, will have a Comfort Specialists Certification. This certification meets the highest standards set by the company as these contractors have to sell a certain amount of Trane products annually and need to produce high customer satisfaction rates in order to be certified. When choosing a dealer and/or contractor, try to find one with this type of certification. Look up the latest tax rebates or incentives before the install to see if you can qualify for savings. Always get at least three bids before choosing a contractor. If you don’t want to call contractors individually, highly consider using HomeAdvisor.com to have the quotes come to you — it’s free. If you’re able to find a licensed contractor who’s willing, you can find slightly used or even new Trane air conditioners one eBay for a lot less than what a local contractor may charge you. My older unit was about 15~ years old and the HVAC guy recommended a newer one. I paid about $7,300 installed for a XL20i. Paid HVAC pro for a new XL15i. It is a lot quieter than my older unit. Time will tell how great it is. Price paid for an XL14c. Compared a lot of units but this one had the features and was efficient enough for our home. My husband is a fool. Ripped off big time. We have had our Trane since 2002 and this summer it ran constantly for 10 weeks at 78 degrees. It keeps the humidity out, therefore making it cooler. It is well worth the price.